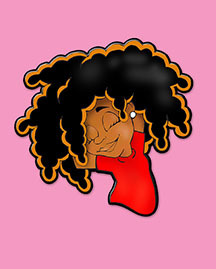 Wilma Wildhair is a movement of self-love. We at Wilma Wildhair, LLC. want all children to know what it feels like to truly love what they see in the mirror each day.This love should also be reflective of the respect and acceptance children have for the various differences that exist among their peers. We pledge to be a positive resource and outlet for all children. Our goal is to encourage our young followers to live in the spirit of Wilma and just be “Happy to Be ME!